The North American hedge funds industry witnessed robust growth in 2013 with the total assets under management (AUM) breaching past the US$1.3 trillion mark, raising the region’s share of AUM to almost 70% of the global hedge fund industry. 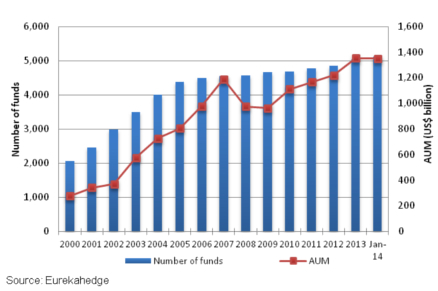 As at January 2014, the total AUM of the North American hedge fund industry stands at US$1.35 trillion managed by a total of 5,122 hedge funds. North American hedge funds saw accelerated growth in the pre-2008 period, suffering a set-back during the global financial crisis followed by a sustained recovery post-2009 that has seen AUM crossing the pre-crisis high. In a period of seven years, AUM grew from a base of US$275 billion in 2000 to US$1,189 billion by end of 2007- a trend that was accompanied by strong launch activity which more than doubled the size of the North American hedge fund industry. The advent of the global financial crisis proved an anti-climax as AUM declined almost 20% from their 2007 peak to US$963 billion by 2009. While launch activity was far from muted during the crisis years, it was matched by a steep rise in hedge fund liquidations which resulted in a stagnation of the industry’s size. Since then the industry has recovered, aided by strong asset inflows and performance-based gains which occurred against the backdrop of a mild economic recovery in the US and an increasing demand for hedge fund exposure by investors looking to reduce the volatility of their portfolios. The North American hedge fund industry witnessed its strongest returns in 2009 with the Eurekahedge North American Hedge Fund Index advancing 24.41% in the year. The next two years recorded strong asset inflows worth US$116.6 billion into the industry despite increased risk aversion in the markets towards the end of 2011 as the Eurozone crisis came centre stage while US lost its AAA credit rating.